What’s the Czech for “Beautiful movie”? I’ve pretty much given up on the Academy Awards for years now, to the extent that I have no idea whatsoever which films have been winning since that hobbit movie. 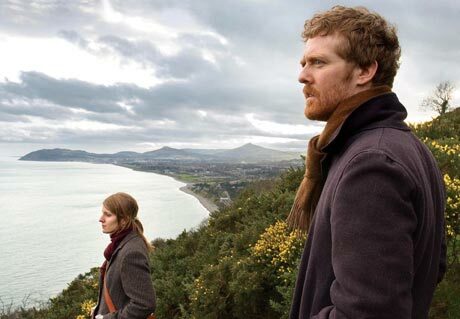 I did hear about that Irish indie romance Once, though, but I didn’t really follow it. On paper (or, more accurately, “computer screen”) it sounded rather twee. Then a message board friend of mine mentioned seeing it. He didn’t write much about the film, but from what he’d written it was clear that I wanted to check out the film. Now I’m in this silly situation: I loved the film and I’d go so far as to say that it’s one of the best, most beautifully told and acted love stories I’ve ever seen on film. I also fear that anything that I might write about it will make the film sound twee. Words such as “sweet” and “charming” come to mind, but they don’t really get at what makes the film work. It’s funny (in a film nerd way, that is): we watched two films on two consecutive nights last week that were amazingly similar in some ways but couldn’t be more different in others: Michael Winterbottom’s Wonderland and, well, Once. Both were filmed simply, going for verisimilitude, especially in the acting and writing. Both were City movies, so to speak, very much rooted in London and Dublin respectively. Both were about people who have to struggle to make ends meet at times, and not the Guardian-reading upper middle class characters of, say, Anthony Minghella’s Breaking and Entering. Yet Once has an artlessness that in its effectiveness is highly artistic, whereas Wonderland never lets you forget that you’re watching a film by a director who wants his directing to be visible on screen. In its digicam, improv way Winterbottom’s film is as much a director’s film as any movie by Scorsese. It is the sort of film that some people might call “pretentious” because it forms its material in unexpected ways and makes this very clear on every frame. Once, by comparison, wants to be a small film, is a small film and knows it. Anyway, enough words from someone who basically said, “Words won’t live up to the film so I’ll keep this short.” Both films, Wonderland and Once, are very much worthwhile. The former is probably more a matter of personal taste – Winterbottom’s films are not likeable as such, nor do they set out to be – but still a definite recommendation. And now I will leave you with trailery goodness and shut up.